What is Barnes and Noble doing right that Borders has done wrong? I drove by a Barnes and Noble this week – they are still open. There’s a Wiki article on them at Wiki on Barnes and Noble. But I wrote an article e weeks ago, looking at Anderson’s in Naperville, Illinois. I compared them with Borders, who recently went out of business. 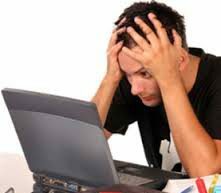 There’s some good articles exploring this theme. Why Borders Failed While Barnes and Noble Survived. This is a recent show on NPR. There’s an article by The Week entitled Why Borders failed and Barnes & Noble hasn’t: 4 theories. Borders did not. Instead, it expanded its physical plant, refurbished its stores and outsourced its online sales operation to Amazon. It’s the media folks. People also read books on Iphone, Ipad and computers these day. 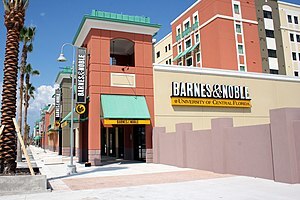 In my area, there were 2 Barnes and Noble stores, along with a Borders store. The day Borders closed its doors, the parking lot was full for a week. Everybody was there to get a cheap bargain. One of the Barnes and Noble stores has closed. But the other one is still going strong. 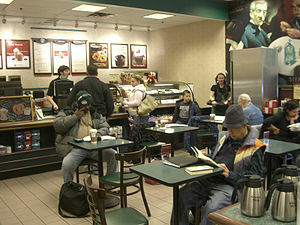 It still has the coffee bar, along with its various selections. In a business article at No Buyers for Barnes & Noble at 60 Cents on Dollar: Real M&A from March 2011, Barnes and Noble was still trying to secure buyers. 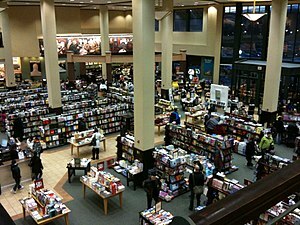 Let’s go back to the article Why Borders Failed While Barnes and Noble Survived. Does the article really answer the question? I think not. Is developing its own e-book reader or handling its own online sales the real answer? An article entitled Why a Green Strategy Will Help Barnes and Noble Avoid Bankruptcy thinks being an environmentalist may be the answer. The real answer may be that Barnes and Noble just had more cash resources and a bit more business sense than Borders. But is that enough to save them? It seems they ignored Amazon too long. It’s like the old Ma and Pa video stores. They flourished until things like Netflix came along. Let’s go back to Anderson’s in Naperville. I did attend a presentation by the Anderson’s owner a couple years ago. It was for the Midwest Technology forum. The family – if I recall correctly – also owns an independent Pharmacy. I did ask how it flourished in the wake of chains like CVS and Walgreens, or big store pharmacies like Walmart and Target. The answer was that folks developed a relationship with the pharmacists, which have been around for years. Sounds a bit like social media – doesn’t it? Next Now that Google brought Motorola Mobility – what will they do with it?